Cold Pizza = Hot Finances! They are all better when there is some leftover, right!… yummm, I’m getting Hungry! ﻿Did you know that the only part of your paycheck that can help you win financially is the leftovers?? This is good news. It means that it really doesn’t matter how much money you make. You have the opportunity to win! I am making a very simple, very blanket statement this week. Feel free to rationalize it away if you wish, but those thoughts are only self-defeating, and I want to promote self-empowering! Increase Your Leftovers = Win Financially! What would you do with them anyway? Do Anything You Want! example: Build your wealth and give a bunch of it away! Getting the picture? Without Leftovers, none of this is possible! Sometime we’ll focus on the mechanics of creating more Leftovers… (like actually eating leftovers, instead of dialing up pizza delivery!) for now, just focus on that concept. It really is this simple. Even more mind-blowing, is that the best way to end up with more Leftovers is to give away your First Fruits! 1 out of every 10 to be exact. Now, to follow the ancient wisdom of Nike – Just Do It! Thanks for hanging with me again this week! Without You, these words mean nothin’. I hope to push your buttons, get your goat or give you something to smile about and say “Yup!” If these blogs become bland and tasteless, lemme know! I’ll be glad to spice ’em up! Holy Crap! – SO MUCH TO DO!!!! Ever entertained a thought like that? If you haven’t then you have been unfairly blessed; please quit reading now and go fly a kite! Seriously, I did kind of go-off last week about the crazy thoughts and lack of focus. Well this week has been another super busy one for me, YAY!! but my inner-mind thought patterns have been much more streamlined and organized. Thank You Lord! But, I will give you Anything but Zero and therefore put one more foot print in front of the last one. Some people laugh… I don’t. This is So Serious! This is coming from a Billionaire! He said he reads it over and over and over to his grandchildren. And the lesson the Tortoise – WHO WINS the race – teaches us is this: Always keep putting one foot in front of the other. Never Ever Give Up. Just keep taking one small step after the other… And YOU Will Win. So many times we get so overwhelmed that we do Nothing, Nada, Cero. In all of these cases what we end up doing is Zero. Truthfully, we can find one small thing to do Today that is a step toward our goals, financial or otherwise. Lets drop it a level further… even if we don’t make a Step in the right direction… If we even begin to Think about taking a step in the right direction… we have done More than Zero and therefore are on the way to the Win. So Start Today. Start with a Thought… even a small one. “I do want to give and live in financial abundance, I deserve it!” or whatever speaks to you. By reading these words, by taking these five precious minutes out of your day, I believe you are on your way.. Get ready, cause the Tortoise is pumped to high-five you at the finish line! Drunk Monkeys end up Fat, Broke and Alone! What has your Mind-Monkey been drinkin? I hope it’s not the same sauce that mine has been swiggin’! That is some powerful potion! “In Buddhism, they like to say that our minds are like monkeys swinging from thought to thought (to thought to thought…). Only, the monkey in our mind is drunk, swinging from thought to thought to thought. Then that little drunk monkey is stung by a scorpion! Swinging feverishly from thought to thought to thought. D’oh. That’s not all, though. Take that drunk little poisoned monkey and make him crazy! Lately my drunken, poisoned, crazy-monkey-mind has been takin’ some speed or something! Seriously, in the last couple weeks the thoughts have been flashing by the hundreds every second in my little brain. I normally experience a couple dozen wild business ideas, faces of people I need to connect with and thoughts of stuff around the house to accomplish, just while brushing my teeth. But that has gone into overdrive lately. I have a new employment position as a social media guru/blogger/internet guy. While settling into this fresh and exciting opportunity it has been hard to reign in my brain as I incorporate a whole new block of knowledge and responsibilty into my life. How much Fun it has been! Well previous to locking-in this new job I had a few goals that I was consistently and steadily working on every day. I had a Tight handle on my daily spending… Like None. I was Ferociously Strict on a diet plan which had helped me drop 20lbs in a month. Then the Mind-Monkey found out about the new job and went Bat-Sh!T Crazy! and even… OMG, “Worked” when I could have been chillin’ with my girl!! Now, I don’t have Any reason to have changed the outcome that I am looking for in all these areas, but my effort to reach those goals has dropped significantly! It is really hard to tame that drunk-monkey-mind!!! This is why it is hard to get out of debt. This is why it is hard to stay on a budget. This is why most people, Yes, like 95% of people are not as wealthy as they have the potential to be! It is hard to stay focused! With a plan of action to follow, like a written budget or a diet meal plan, it is easier to know if you are on or off track… However, you do have to actually look at the budget or have a meal plan to start with. I have completed the first step in calming and sobering up my plastered primate: I realize this is a problem! But, you know what? Today IS St. Patty’s Day 🙂 Maybe I’ll start the sobering up process tomorrow! Believe me, with powerful focus, intensity and love-from-above: your potential and possibilties are LIMITLESS!!! Ice Ice Baby – Stop! Collaborate and Listen! Anything broken around your house? Something that has been in disrepair for awhile, but you’ve learned to live with it? Here at True North FFC headquarters it is the Ice Maker. It be busted! Our freezer’s ice maker went out last summer and in the blink of an eye, here it is spring-time and it still isn’t fixed. Anyway, how have we survived without this vital piece of equipment? We go Old School. Well here is the point of today’s blog: Have you filled up an Ice Cube Tray lately? I have been for several months now, and I learned something about this seemingly simple task. A slow and steady stream works best for proper fillage. Ideally, each little cubie-cup has been leveled to a uniform amount all the way up and down both rows. Now, how do you think a “get-it-dun” and “get-on-with-life” guy like me was trying to speed up this process? Uh… except that doesn’t work. Most of the H2O hits the cups fast, shoots up and over the edge… then down the drain! Well just like filling up an ice cube tray, Money works best for us when it comes in a steady predictable stream and we carefully plan where to put it. Is that how life usually send us our money? Sometimes, sure. A salary job or regular paycheck can work like that. We should have our budgeted cubie-cups ready to catch a certain amount every month. But what if money comes in spurts or rushing in? We all want to win the lottery, but what about more realistic chunks of change? How do we handle a $1500 Tax Return? What about selling a toy or extra vehicle on craigslist for a couple thousand? Or maybe an inheritance? What happens when the money faucet turns on and we try to handle a bunch of dollars at once? Most of us would love to have that problem, right? Well truthfully, without proper planning, most of that extra money will end up down the drain! Maybe we should catch that extra cash in a big savings account bucket, then slowly and methodically plan out our new financial situation. Have you ever made a foolish purchase with that tax return money, when you still owe on your car or credit cards? I sure have. That was back when I was wasn’t living on a plan and wasn’t getting anywhere financially. Put those days behind you too by slowing down and looking at where your income is going. I hope you start to find excitement in saving those dollars and planning for your financial future, instead of letting it drain away. This is exactly what the wealthy people in the world do. And by switching that pattern, you become one of them too. Someday, when I feel I’ve saved enough, I may spring for a new ice-maker… for now though, I’m getting pretty good at filling the trays! Sunshine, Palm Trees & Seafood Baby! Are you stranded? Have you been feeling stuck? Are coconuts and crabs all you have eaten for the last four years?? 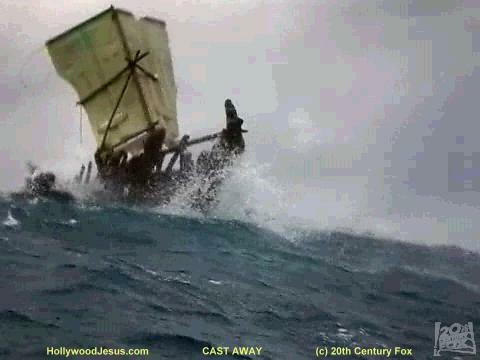 Recently my Cuz, Tera and I watched the movie Castaway with Tom Hanks. It’s been years since I’d seen it, and I’m really glad to have a new perspective on the concepts covered. As a chubby executive Tom finds himself in the most unlikely of situations alone on an island. At first he is frustrated with his situation and lack of survival skills. He continues trying to survive and learn and eventually becomes very good at it. Throughout this process he rides the range of emotions, befriends a volleyball and even considers suicide. He fails at the testing of the attempt and therefore succumbs to complete powerlessness. How often in our lives do we find that whatever island we are on, it can be just as lonely. It can be a financial island of debt. It can be an island of love-less solitude, a dead end job or lost hope that we deserve to be happy. Tom has a monologue at the end of the movie where he explains that he finally realized that he was not in control of anything. He gave up trying to make his escape happen on his own. An understanding came that he could Not make it happen on his own. Then one day the Tide brought him a sail. How they never get around to mentioning God, I have no idea 🙂 It is almost comical that the whole movie explains the human relationship with faith and the almighty and they never say it out loud! Anyway, two walls of a johnny-on-the-spot show up one day. Ah-Ha! Hope arrives by divine intervention! He was not out of energy, but reignited with passion for life and he has a new goal. To get off that island! Just when we think all hope is gone. Just when we finally give up and decide we are incapable of controlling things with our own two hands. That is the moment that our Tide will come in. A couple years ago I made the realization that I was ruining my financial life with my own ideas and plans and actions. It was a lonely place, knowing I was broke and it was all my fault. I knew that I was not going to dig myself out of the bottom of that hole. God (NO, Not Dave Ramsey 🙂 put information into my life. A sail had showed up. The answers were right in front of me. 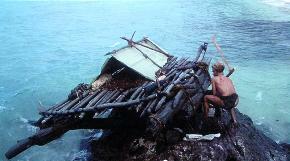 All I had to do was put in the effort to build my raft. At that point, following the baby steps was the easy part. It was not only a way to improve, but it was imperative to my survival. When is your sail going to show up? Have you decided that your efforts alone can only take you so far? Lately my adventure of self-employment has been nearing the edge of a cliff. I have cut my lifestyle to nothing. I am about to have to tap into funds that I never wanted to touch. I’ve been struggling and pushing to grow this coaching business. It has not been easy or fruitful so far. Something had to give. I finally realized that success in this endeavor will not depend on another hour spent writing a blog or another 10 links posted to fans of my page. This wonderful information and passion will connect with the right people at the right time for them and for me. A position with a great small company that is so custom tailored for me that no one but God could have penned it any better. I now work part-time for http://www.kandgcycles.com/ as their Social Media Creative Genius. I get to work from home. Motorcycles have been a passion my whole life. I am using all the things I’ve learned while building this business online from the ground up. I will continue to build True North FFC just as I have been doing 🙂 YAY!! Thanks God – For everything, especially the sail, the tide and Yes even the island that keeps me out of the Ocean.